The Gallagher Chiefs have returned from the international break in style with a comprehensive 45-22 win over the Highlanders at ANZ Stadium in Suva, Fiji. Right from the first whistle the Gallagher Chiefs were on top of their game, showing no signs of rust after three weeks off, with six first half tries launching them to a 23 point victory that fires a warning shot to the rest of the competition with the playoffs just around the corner. The second half belonged to the Highlanders in what was a wildly entertaining 80 minutes of rugby, much to the delight of the large and vocal Suva crowd, but the damage had already been done earlier in the match with the result never really in doubt after the early burst of Gallagher Chiefs scoring. With the wind behind them in the first half, the Gallagher Chiefs got off to the perfect start with a try inside the first two minutes of the match. Solomon Alaimalo burst into a gap from 40 metres out after some nice build up play, and the fullback showed great pace to beat the defence and score under the posts. The early try gave the Chiefs plenty of confidence and they completely dominated the next 10 minutes. After inching their way towards the line, they were finally rewarded with more points as wing Toni Pulu muscled his way over for the second try. Just two minutes later there was a third try on the back of more good field position thanks to a great clearing kick from Charlie Ngatai. Some slick handling by loose forwards Sam Cane and Luke Jacobson ended in prop Karl Tu'inukuafe getting the try. The Chiefs continued to keep their foot on the throat, and their dominance in possession and territory led to yet another try as halfback Brad Weber picked up from the back of a messy scrum before producing a superb offload in the tackle to Luke Jacobson who stretched out to score. First five Damian McKenzie nailed all four conversions for a 28-0 lead after just 25 minutes. A yellow card for Number 8 Luke Whitelock's deliberate knock down then made matters worse for the Highlanders, and from the resulting scrum wing Sean Wainui squeezed his way over the line in the left-hand corner. Just as it looked like the Highlanders were finally working their way downfield, a turnover from the Chiefs saw them counter attack in style with Alaimalo making the initial break, with the ball spun wide for Pulu to race away for his second try. That was to be the final play of a remarkable first half, with McKenzie maintaining his perfect strike rate from the tee to convert the fifth and sixth tries and make it a 42-0 lead at halftime. The Highlanders needed to respond quickly after the break and did so with a nicely worked try to second five Teihorangi Walden just a few minutes after the resumption of play. From the kick off they broke clear immediately with second five Rob Thompson bursting through a gap to score a brilliant try - but it was ruled out due to a knock on in the build-up. The action continued to swing from end to end with with some sensational ball movement which ended in the Chiefs' defence being stretched and Walden going over for his second try. Momentum was now all with the Highlanders and they threatened to add further points on several occasions, but the Chiefs hung in there with some desperate scrambling defence. As the fast and frenetic match headed into the final quarter, the Highlanders crossed for a third try to replacement prop Aki Seuli. Despite their second half resurgence the Highlanders still trailed by 25 points with time quickly running out. A rare second half visit into the Highlanders 22 for the Chiefs saw them come away with three more points thanks to a Damian McKenzie penalty. 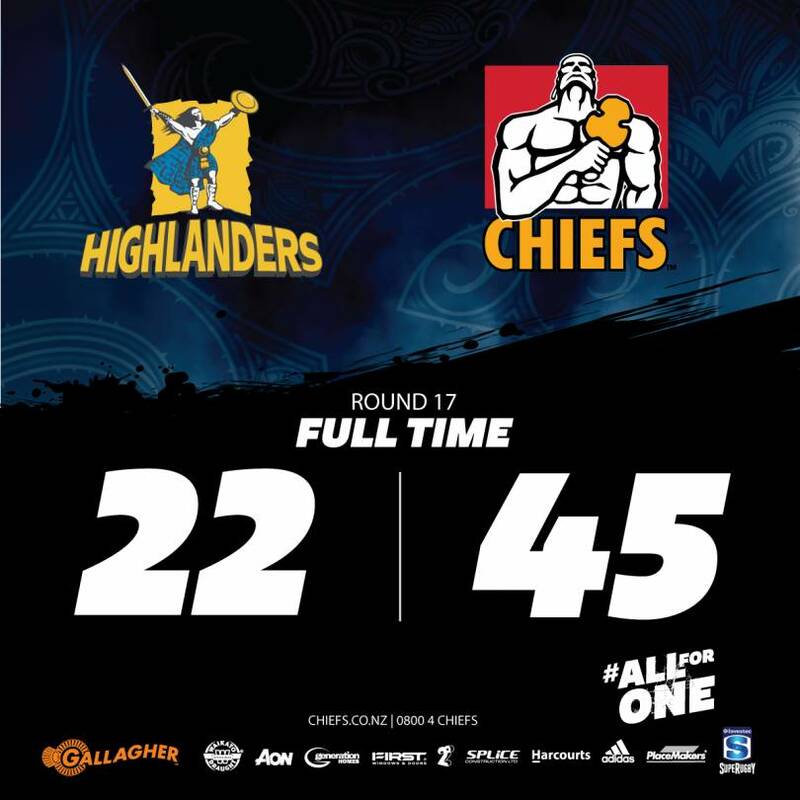 With just a couple of minutes left the Highlanders managed to have the final say of the match as a fourth try, scored by replacement Shannon Frizell, denied the Chiefs a bonus point. Gallagher Chiefs 45 (Toni Pulu 2, Solomon Alaimalo, Karl Tu'inukuafe, Luke Jacobson, Sean Wainui tries; Damian McKenzie 6 cons, pen) Highlanders 22 (Teihorangi Walden 2, Aki Seuli, Shannon Frizell tries; Lima Sopoaga con) HT: 42-0. The Gallagher Chiefs now return home for their final two round robin matches against the Brumbies (Sat 7 July, 5.15pm) and Hurricanes (Fri 13 July, 7.35pm).